Live April 3, 2019. There are things I can never explain, but I can play them a song. For She and thee, I await, coiled snake upon and around the blackest of eggs, the seeds for apocalypse, and the resting place of all my hopes. This Equinox never did fade. But, even I must return, even if it is not the same who left. @jonathan_beckenstein: One of my favorite movies, it's not every day you get intellectual violence with a sense of reality and humor! @rfurtkamp: I've never seen it, and I think I will. @jonathan_beckenstein: No, I was drawn to it during my yearly Equinox working. 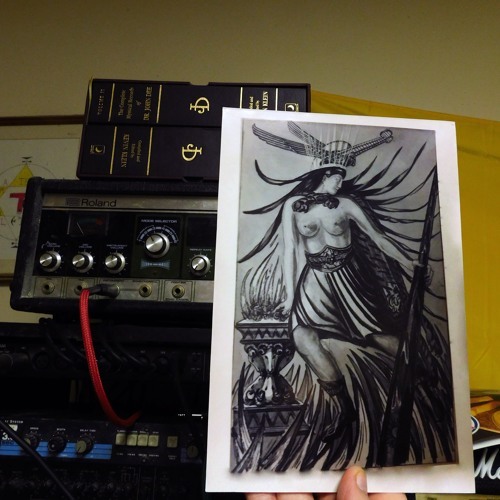 It's an alternate version of the Princess of Wands from the Thoth Tarot, Lady Frieda Harris. Penn State has most of her papers and ...alternate versions ( Mortlake Collection ) After being directed to it, I NEEDED very badly to have a copy printed professionally. So I did. Beautifully paced and developed. And I must ask, is the art work your own? Oh, I am so in for an opening like this. And where shall we travel? @bill-boethius: This, in its own way, is the summation of the lats two weeks for me in one glorious burst. @bill-boethius: That was the little Marshall that not just could, but does. Only thing that actually gets slammed, the other two amps stay clean. Volume 10, gain about 2/3.